Modern high-speed integrated circuits can be fragile things. Even a single fault can often render them completely inoperable. But a team of researchers at the California Institute of Technology (Caltech) says it has developed an "immune system" for chips that can allow circuits to route around problems and keep working in the face of failures – even ones as catastrophic as being blasted with a high-energy laser. The team demonstrated the technology using a millimeter-wave power amplifier – a type of cutting-edge circuit used for next-generation communications, imaging, and sensing applications. Even after they zapped the chip repeatedly with a laser, utterly destroying some of its components, the self-healing system was able to detect the faults, route around them, and continue to function at near-optimal efficiency. "It was incredible the first time the system kicked in and healed itself. It felt like we were witnessing the next step in the evolution of integrated circuits," said Ali Hajimiri, a professor of electrical engineering at Caltech. The system works by equipping the power amplifier with a collection of on-chip sensors that monitor current, voltage, power, and temperature. 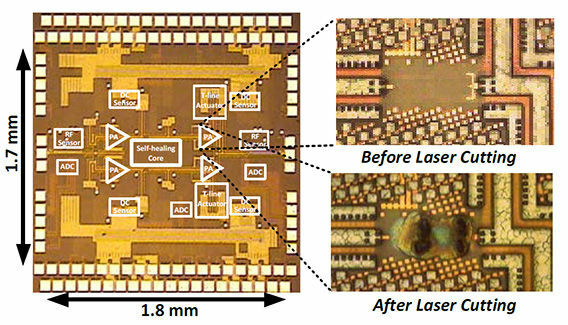 The data from these low-power sensors is then fed into a custom on-chip ASIC that controls the self-healing process. The ASIC itself is a simple, modular global state machine that can run a variety of self-healing algorithms. In the current implementation, two separate algorithms sift through 262,144 possible states to find the optimum solution for the amplifier's current operating condition. The ASIC then reroutes the circuit accordingly, using on-chip actuators. "We don't know all of the different things that might go wrong, and we don't need to," said graduate student Steven Bowers of Hajimiri's lab at Caltech. "We have designed the system in a general enough way that it finds the optimum state for all of the actuators in any situation without external intervention." In the boffins' experiments, the chip could self-heal in a maximum time of 0.8 seconds with the ASIC running at a clock speed of 50MHz, and when the clock was cranked up to 200MHz, healing scaled cleanly, taking place in a maximum of 0.2 seconds. And while it's the rare circuit that will need to survive being caught in a high-energy laser crossfire – for now, at least – the researchers said self-healing technology is perfectly applicable to much more mundane kinds of faults. Fabrication process variations, environmental factors such as temperature and load mismatch, battery power fluctuations, and normal aging effects can all cause integrated circuits to behave in suboptimal ways, and self-healing can be used to correct for all of the above. The Caltech team compared 20 different chips and found that chips equipped with self-healing technologies performed more predictably and reproducibly than those that couldn't self-heal. The team also claim that the self-healing chips consume half as much power as the non-healers due to the fact that the healing ASIC searches out the circuitry route that provides optimal power-saving. Exactly how that real-time route-finding can be more efficient than preproduction optimization modeling on undamaged chippery, the Caltechies don't explain – at least not in a clear enough summary that we could get our heads around. Hajimiri said the fact that Caltech was able to make their self-healing technology work with as advanced a circuit as a millimeter-wave power amplifier demonstrated that the system could eventually be extended to work on any kind of electronic system. "It is truly a shift in the way we view circuits and their ability to operate independently. They can now both diagnose and fix their own problems without any human intervention, moving one step closer to indestructible circuits," Hajimiri said.